His / her act is completely live with jokes, outrageous humour, patter and song, more suitable for an adult crowd, Davina really works the audience. His work as a Drag artiste allows him to perform at anything from corporate events in top hotels to ladies hen nights, mixed cabaret and of course gay pubs and clubs. In fact he was one of the first acts to do the Adonis Cabaret Show! Davina’s costumes can be outrageous or glamorous, he has been the stunt legs for tights adverts and appeared on TV, on The Christian O’Connell Show, Brian’s Boyfriends and Lounge Living to name just a few. He also has plays at Maspalomos pride in Gran Canaria and main stage at Brighton Pride every year. 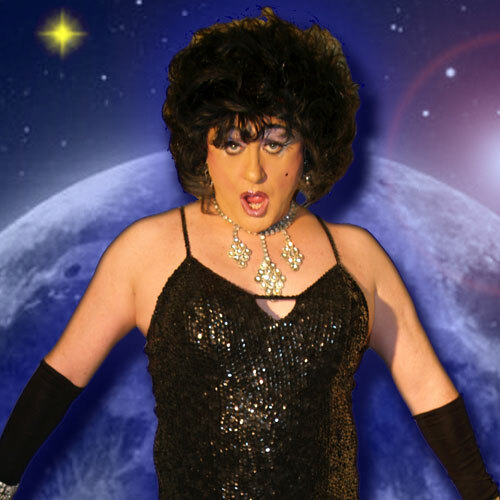 Whatever your event, Davina is an all round stand up Drag and ideal for your venue! David even has a complete sound system if required. Just don’t tell his wife, she thinks he’s playing darts at the British Legion LOL !! !